Highline specification including Cruise Control, Bluetooth, DAB Radio, Rear Parking Sensors, Single Sliding Door, Heated Windscreen, Leather Multifunction Steering Wheel, Electric Windows, Air Conditioning, 16" Clayton Alloy Wheels (Optional 17" Devonport Alloy Wheels as pictured + £500), Halogen Headlights with Cornering Assist & Daytime Running Lights. 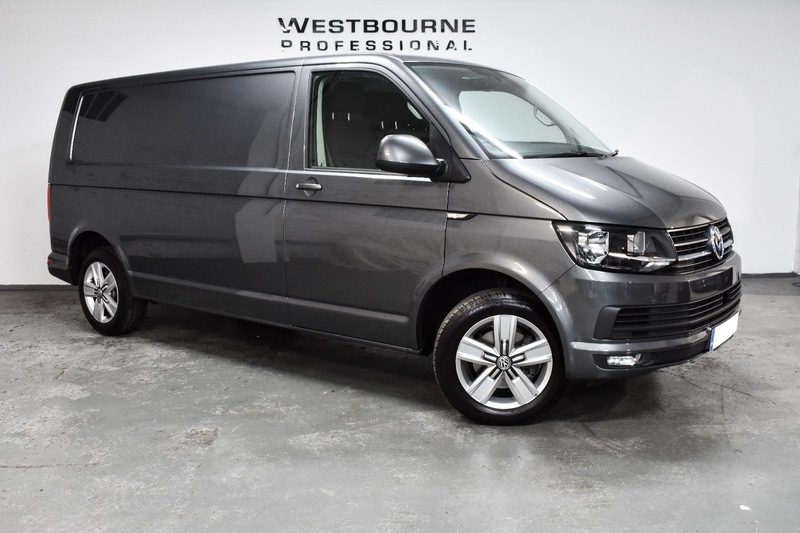 A one owner / driver vehicle direct from our partner company www.vanandkombi.com, this example is the 150ps engine with 6 speed manual gearbox, finished in Indium Grey Metallic with Black Simora Cloth interior, and benefitting from the remainder of VW manufacturers warranty to March 2021. Perfect base vehicle for day van or camper conversion. Westbourne Professional are VW Transporter Specialists and able to offer upgrades including Alloy Wheel Upgrades (including 20") Lowering, Front and Rear Spoiler, Side and Roof Rails, Leather Seats, Sat Nav, Reverse Camera, Carpet Lining, LED Lighting, Acoustic Sound Deadening and can arrange Kombi and Camper Conversions. Westbourne Professional are proud to be an AA Approved dealer, all our retail vehicles are supplied HPI clear with Warranty, MOT, Independent Mechanical Inspection and 12 months free AA roadside assistance. Full dealer facilities on offer with us include part exchange, 12, 24 and 36 month warranty upgrade, finance (subject to status), UK and European delivery, tow bar fitting and much more. Our 5,000 sqft indoor showroom is located in a historic army barracks close to the Sheffield city centre and just minutes from the M1 and Sheffield Train Station. In order to offer the personal service we pride ourselves in, all viewings are by appointment.